Silver is a white and lustrous element that was discovered about 5,000 years ago. The discoverer of silver is unknown. The chemical symbol, Ag, stands for Argentum in Latin. The name silver comes from the Anglo-Saxon word seolfor. Silver comes from igneous and sedimentary rocks. Silver has been coined since 700 BC. 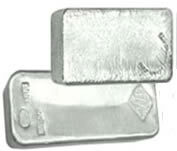 Silver is so malleable that it can be pounded to a thinness of 6/10000 of a millimeter. Silver has the highest degree of optical reflectivity of all elements. A silver mirror can reflect about 95% of the visible light spectrum. Silver is used in solar panels and automobile rear window defoggers because silver is the best conductor of heat of all elements. The element silver is a lustrous white, ductile, malleable metallic element, having the highest thermal and electrical conductivity of the metals. Silver is highly valued for jewelry, tableware, and is used in coinage, photography, dental alloys, soldering alloys, electrical contacts and printed circuits. The term 'sterling silver' in reference to the grade .925 silver emerged in England in the 13th century. Copper is the most common metal used to round out the 7.5 percent alloy balance in sterling silver. Silver compounds were used in World War I because medicines were not yet invented. The silver was used to prevent infection. Once antibiotics were created, silver was no longer used. Hipprocrates wrote that silver had beneficial healing and anti -disease properties. The expression 'born with a silver spoon in their mouth' stems from health rather than wealth status, as children fed with silver utensils were believed to be healthier. Silver iodide is often used in cloud seeding. A pound of silver iodide is enough to seed many cubic miles of clouds. Silver-based water purification units for the home have been in use in Europe for more than 50 years. The units take advantage of the outstanding bacterial disinfecting properties of silver and meet the National Sanitation Foundation Standards covering bacteriostatic efficacy, the reduction of lead, copper and particulates and the reduction of taste and odor. They also have the approval of the US Environmental Protection Agency as a bactericidal unit.